Life will be just fine without the iPhone! Today, we’re going to talk about what I see next and why Apple’s latest results are the closest thing you’ll ever see to an engraved invitation on Wall Street. Apple is one of those companies Wall Street just can’t get right lately. Why boggles the imagination, but the facts are the facts are the facts. The company is making a fundamental pivot into services and, specifically, into the single most lucrative market in the world… healthcare. Team Cook has hired 40 to 50 doctors in past few years, according to Business Insider, but those are just the folks that we know about. I think the figure is probably double that because they’re scattered throughout several critical divisions – all of which will play into healthcare and huge profits down the line. They’ve all got board-certified, actual MDs at their disposal and are working closely on new product development. Whether you believe this or not is the real issue. It’s also why many investors and legions of Wall Street’s best financial analysts have totally missed the boat here. They simply cannot process that the company that brought them the iPad and iPhones would leave “that” behind. Well, they’d damn well better learn. Quickly… because they may not get another chance. Not the iPod or the iPhone. Then – and here’s where you really want to focus – he told every investor who’s paying attention exactly where he is taking the company next. Cook continued saying that Apple’s business has “always been about enriching people’s lives,” and he called out both the ResearchKit and CareKit as being illustrative of the effort. The company is making new software to perform clinical studies. Apple is rolling out apps that will enable highly personalized medical information to be stored, shared, and acted upon. The Apple Watch, for example, is capable of reading your heartrate and notifying you if it detects any irregularity. There have already been reports about how it’s saved lives and the now famous story about a Reddit user identified as “edentel” is a case in point. Endentel thought there was a glitch in the Apple Watch Series 4 he or she was wearing after running the new EKG function, only to learn from a doctor at Patient First that it had probably saved his or her life. Bear in mind, this is a company sitting on $245 billion in cash, up from $237.1 billion last quarter. Wall Street has fallen all over itself trying to figure out how that’ll get spent and which companies make suitable acquisition targets. Everybody from Sony Corp. (NYSE:SNE) to Tesla Inc. (NasdaqGS:TSLA) has been mentioned. Thing is, these same folks have all been barking up the wrong tree. The big picture is clear as day when you get rid of the noise. The real move will be into insurance – or something closely related. Perhaps even an entire hospital chain, which will move Apple closer to patients. As of November 8, there are 132 hospitals, clinics, and healthcare organizations already using the company’s health records feature, and I have heard unofficial numbers that’s grown to nearly 200 – but I can’t substantiate that at the moment. This makes tremendous sense when you think about it. Alphabet Inc. (NasdaqGS:GOOGL) and Amazon.com Inc. (NasdaqGS:AMZN) are fighting for data and consumer access while Cook has made the conscious decision to target health as his entrée. He’s got the devices, the users, and the subscription models needed to lock on before competitors can even process the move. What’s more, services revenues have a 62.8% profit margin. This country spent $3.7 trillion on healthcare in 2017, according to the federal government. Harvesting even a fraction of that could completely transform Apple’s income stream. 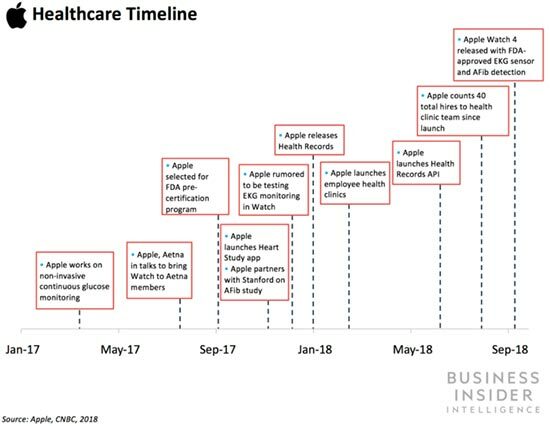 Apple wants to provide you with the tools needed to transition from a passive recipient of healthcare services and spending to an active patient in charge of your own health. All of which will be monitored, analyzed, and reported by Apple devices, naturally. Consumerism will, as we have discussed many times, redefine healthcare and Tim Cook knows this, which is why he wants to be first in the game with a scale that defies competition before it even really gets started. So, how do you play along for maximum profits? First, get over the notion that iPhone production numbers matter, and leave that to the old-school sell-side analysts stuck in their ways. The sooner you focus on what Cook is saying, the sooner you’ll start lining up profits of your own. Second, make sure you’ve got shares of Apple tucked away somewhere. Shares are already up 16.37% from the 52-week low of $142 a share on January 3, and anybody who sold out is wishing they hadn’t. Buy shares directly or load up on one of my favorite “26f programs” – those that I recommend in our sister service, the Money Map Report. Third, get ready to buy specialized technology companies and alternative healthcare providers moving towards Cook’s vision and sell traditional insurance companies that fail to implement the changes ahead and which are moving away his vison. Obviously, this is a story that won’t come to an end anytime soon, which is why, as always, I’ll be right here with you every step of the way. Apple has no interest in anything but control. They don’t give a hoot in Hell about people except for ways to control them. First Keith I wish to thank you for airing your new project, the straight line project. At this time I am not able to afford a membership as I am a medically retired firefighter and my monthly income is not much to speak about. The brokerage firm I am with also has me on level two so I am not able to trade options as yet, however with the stocks I am trading I am in the green. Hopefully you will have a seat open when I am able to trade options because I plan to hit this market with a vengeance. I am hopeful that some day I will be able to attend a conference and shake your hand for helping the average person like myself to get a leg up in life and out of the rut we are living in now. Your analysis makes Apples direction seem obvious and very promising. Good insight. I always wonder, when Warren Buffet takes a long term positions in a company, and it seems to be going poorly, if it isn’t based on analysis that shows a good long term outlook that most folks just aren’t aware of.